Mighty portable music player lets you use Spotify without a smartphone | What Hi-Fi? The portable music player is designed for fitness fanatics who don’t want to carry a smartphone, but still want to listen to music on Spotify. And it looks like an iPod Shuffle. Apple may have killed off the iPod as people switched to smartphones and streaming services, but it's increasingly clear dedicated portable music players still have a place in the market. Astell & Kern, Sony and Pioneer have all recently launched players for people who don't want to use a phone but still want music on the move, whether playing hi-res downloads or listening to lossless streams. Mighty is the oddly-named new portable music player looking to combine the best of both worlds, as the first portable device that can play Spotify on the move without the use of a smartphone. You’ll need an Android or iOS device to set it up at home, but after that you can go running or to the gym sans smartphone. You'll need to be paying £10 per month for a Spotify Premium subscription, after which you can sync your Spotify account with the Mighty and make your music available for offline listening. 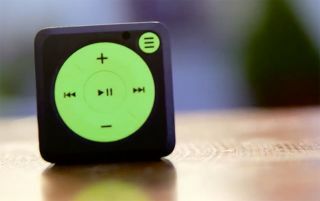 The compact player has physical buttons for controlling music playback and 2GB of internal storage, which the makers say is enough for 48 hours worth of music. You can use a pair of wireless Bluetooth headphones with the device thanks to built in Bluetooth 4.0 and the internal battery claims to last five hours. The team behind Mighty says they’re working on an update to allow for 10 hours of playback time. Mighty is currently seeking $250,000 of funding on Kickstarter, where it has amassed just over $75,000 in a couple of days. You can pre-order a Mighty music player from $79. Check out all the details on the Mighty Kickstarter page.